Tributes to Enda Kenny have ranged from supporters heralding him as an outstanding leader to opponents praising his years of service. Fine Gael deputy leader Dr James Reilly said: " I think Enda Kenny has proved himself to be one of the outstanding politicians of this century and the last." Leo Varadkar, Social Protection Minister and the favourite to replace Mr Kenny, said the outgoing Taoiseach is owed a debt of gratitude. 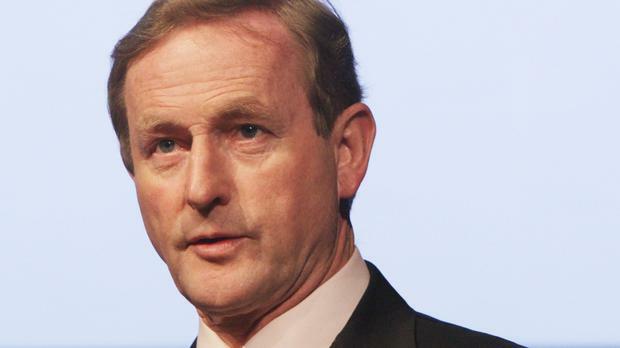 "Enda gave hope to a battered and bruised Ireland in 2011. His dedication and determination gave Fine Gael a landslide in that year's general election," he said. "But more importantly he brought this country back from the brink of economic collapse, and offered politically stability when countries across Europe were staring into the abyss." Micheal Martin, whose Fianna Fail party has propped up Mr Kenny in government since last year's election, described his rival as decent. "One of the fundamental tenets of our democracy is a commitment to public service and the Taoiseach has more than fulfilled that obligation. He has worked diligently for his county, party and country over a long period of time," he said. "While over the years we have had our differences on many political and policy issues, I have always appreciated Enda's decency, good humour and approachability." Sinn Fein president Gerry Adams said he believes Mr Kenny did his best from his perspective. "This is a do-nothing government courtesy of the confidence and supply arrangement with the government's partner in Fianna Fail," Mr Adams said. "The reality is that so-called new politics, led by Mr Kenny and Micheal Martin, isn't new at all. "As a result, there is a deep paralysis in the body politic. "The reality is that Fine Gael, no matter who leads them, are firmly wedded to the policies that cause so much hardship in the daily lives of ordinary people." Green Party leader Eamon Ryan TD called for a new Taoiseach to be in place before June 22 when the next European Council meeting takes place. "Whoever attends this council meeting must do so with the mandate of Dail Eireann," he said. "Whoever attends must do so with their administration up and running as fully as possible. Ireland is facing a time of huge uncertainty and historic challenges - Enda Kenny's successor must begin to tackle them as early as possible." Housing Minister Simon Coveney said Mr Kenny has been a towering figure in modern Irish history and will be recognised as such. "His record in Government since 2011 will be viewed very positively by historians, not least how he led the restoration of our economic financial independence over that period, which was a landmark event," he said. Labour leader Brendan Howlin said: "I believe that Enda Kenny will be remembered as Taoiseach of the Government that brought our country back from the brink. "The period from 2011 to 2016 was a difficult time to hold public office in Ireland. But regardless of the challenges we faced, Enda Kenny took them on with humour, grace, and determination."